The Keypad-Locking Key Safe with Drop Slot from Barska has room to securely store and organize up to 144 keys, and features a drop-slot for users who don't have access to the keypad security code. The keypad stores one 3-8 digit PIN and two backup barrel keys are provided for access when the code is unavailable. The safe comes with 144 color coded key tags with a blank space for labelling. Four AA batteries are included, and a low-battery alert signals when they need to be replaced. The 17 x 5 x 26", 43.2 lb. safe features solid steel construction and two solid steel deadbolts. Four pre-drilled mounting holes and the required hardware are provided. 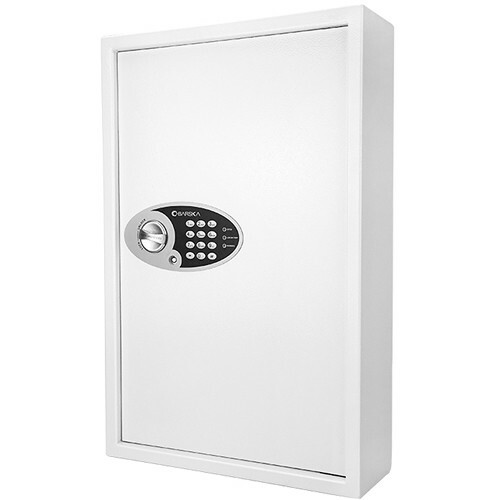 Box Dimensions (LxWxH) 28.3 x 19.7 x 7.4"
Keypad-Locking Key Safe with Drop Slot is rated 1.0 out of 5 by 1. Rated 1 out of 5 by cj from Garbage I was attempting to reset the alarm on my safe when I realized that my safe came with neither an instruction manual or a key. After finding the online manual I attempted to reset the safe with the instructions and it failed to be reset. Following multiple calls to Barska for help on resetting the safe they finally answered and were unable to help us with the safe. They suggested that the safe was faulty and could not be reset. The 30 day warranty had ran out and they claimed there was nothing more they could do. A complete waste of time and money.